Ever dreamed of being your own boss and becoming filthy rich? Now you can live the luxury 8-bit life you’ve always wanted! 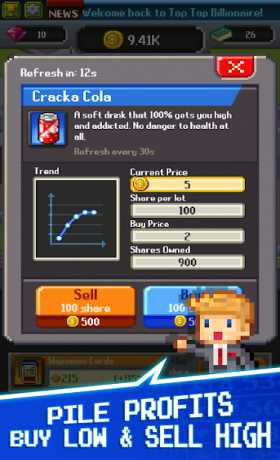 Crush your competition, become a Door Street tycoon and tap your way to mega riches on Tap Tap Trillionaire – the fast paced business simulator! Using the profits from your business, you’ll be able to hire traders to support your venture. Not all traders are created equal, though! From one star intern Dexter to five star, legendary trader Indiana Ford, better traders will generate more money and have a higher success rate with their investments! Upgrade your traders to boost their success rate, increase the money they make and – that’s it. ★ Buy low. Sell high. Get rich! There are many ways to tap your way to a trillion dollars and become a tycoon! Your team of Door Street traders will give you investment opportunities you can accept or decline. Depending on their success rate, you could win or lose. We probably wouldn’t trust Dexter with large investments, by the way. While your team works to make you filthy rich, you can use your money to trade stocks, artifacts and bonds. Take a look at market trends and invest wisely to make huge profits. With over 45 different assets to invest in, you’ll have hours of fun mastering the markets in this insanely fun business simulator! ★ Expand your office. Move to a castle. Do whatever you want – you’re rich! Plain office? Boring! Upgrade the furnishings and decorate your office with your hard tapped coins. Add comfy chairs, buy state of the art computers and decorate your office for the holiday season! When you become so rich that a simple office simply won’t do, you can expand to house a larger team – and even move to a castle! • Accumulate riches and make trillions of coins. Sweet, gold coins. • Featured in US, UK, and 126 other countries on the top Play Store’s Best New Games! 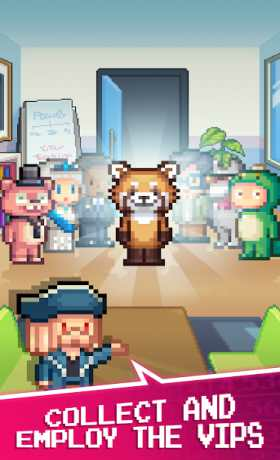 Tap Tap Trillionaire is an excessively fun, strangely addictive business simulator game for the passionate capitalist. If you’re a fan of getting rich – and let’s face it, who isn’t? – then you’ll love this game! Pssst… Here’s a little tip for reading all the way to the end. You can tap much faster if you use more fingers. Happy tapping! 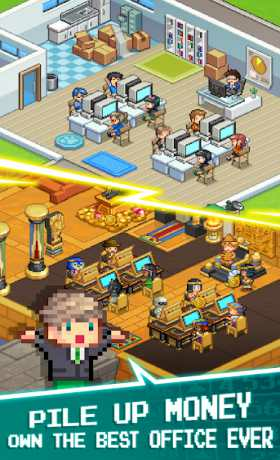 THE JOURNEY TO RICHES STARTS WITH A SINGLE TAP – BECOME A TRILLIONAIRE TYCOON TODAY!